This is the third of a three-part Winter Survival Guide series. More than 70% of the nation's roads are located in snowy regions, which receive more than five inches average snowfall annually. Each year, 24% of weather-related vehicle crashes occur on snowy, slushy or icy pavement, and 15% of crashes occur during snowfall or sleet, the U.S. Department of Transportation’s Federal Highway Administration reports. Even armed with all the statistics possible, driving on winter roads can be scary, alarming, and dangerous if you don’t know how to properly handle each situation. We offer guidance and instructions on how to handle three situations that can make winter driving hazardous. Ice forms when the road is wet and its surface temperature drops below freezing. Black ice is a thin layer of ice that forms on the roadway, but instead of looking icy, the road appears wet. It usually has a matte appearance rather than the glossy one typical of icy roads. Black ice tends to form at night or early in the morning, and drivers tend to not notice it until they've lost control. If you encounter black ice, stay calm. Keep the steering wheel straight and do not hit the brakes; if you do, your vehicle could go into a fishtail, which is when your car’s rear wheels lose traction. Ease off the gas pedal and if you can, shift into a lower gear to gain more control. Steer the car in the direction you want it to go. Tip: Going into a fishtail means your car is going too fast for current road conditions. Slow down. Running into a slow-traveling snow plow can be tedious and aggravating if you’re in a hurry. But, there’s mistake No. 1: When driving in the winter, always give yourself extra driving time to ensure you drive slow and safe. Should you encounter a snow plow on a road, don’t crowd the snow plow. And most of all, do not try to pass it. Some snow plows work in tandem/echelon plowing, which staggers multiple plows to cover all lanes and clear the entire roadway in one sweep. It is extremely dangerous for drivers to pass a snow plow in this situation as they could enter white-out conditions and ridges of snow between lanes. Even passing a regular snow plow on the right can be dangerous. 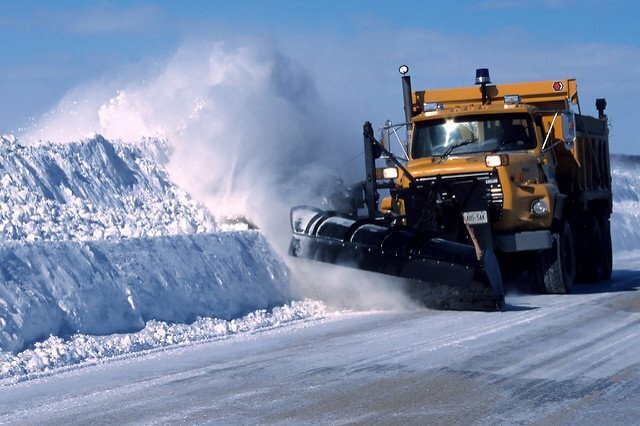 Plows are designed to push all snow, rocks, slush and other debris to the right of the plow. All that debris could damage your car—and also you. Deer breeding season runs from October to January, and during this time deer are highly active and on the move. When driving, watch for the shine of eyes along the roadside and slow down. Use your high beams whenever the road is free of oncoming traffic, as this will increase your visibility and give you more time to react should you see the shine of eyes. If you’re on a multi-lane road, drive in the middle lane. If you encounter deer on the road, ideally, you should try to slow down and then veer around it. But if you only have time to pick one, remove your foot from the accelerator and let your car slow down. Veering or hitting the brakes at too high a speed could result in hitting other objects like trees or parked cars, or flipping your vehicle. And hitting a deer head on at a high speed might send it crashing through your windshield. Overall, it’s smarter to reduce your speeds at night, particularly in rural areas.